Original limited edition printing design of The Golden Decade. Gerhard Steidl already redesigned the book, fonts and colors with a more contemporary art book layout and look. 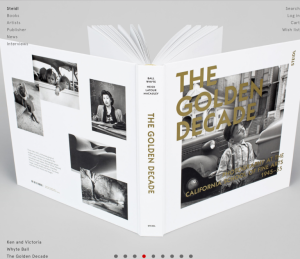 The Golden Decade: California School of Fine Arts Photography 1945-55 by Ira Latour, Cameron Macauley and Bill Heick, edited by Ken Ball and Victoria Whyte Ball, sold out in two special oversize limited editions of 100 books each in 2010. 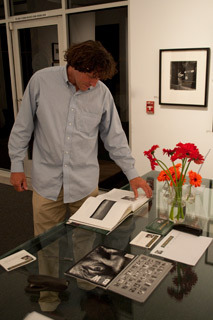 In conjunction with the release of the book, Smith Andersen North Gallery held a two-month exhibit of original darkroom silver prints by 36 students of Ansel Adams and Minor White. Now The Golden Decade will be published by world-premier art book publisher Steidl of Germany and is in pre-production. Ken and Victoria Whyte Ball recently traveled to Gottingen, Germany for the beginning of pre-production to work with Gerhard Steidl on the layout and design of the book. The production process with a master art publisher such as Steidl, Ken and Victoria said has been fascinating, besides, the Balls had fun in Steidlville getting to know the other photographer teams and curators also putting books together including Joshua Chuang from the Center for Creative Photography in Tucson, Arizona and Anna Davidson, daughter of New York Magnum photographer Bruce Davidson. Follow the Ball’s adventures in Germany and the Golden Decade journey into print at a delightful blog Victoria has been writing called the Golden Decade Blog, supplemented by Victoria Whyte Ball’s Facebook page. 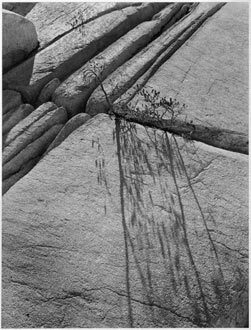 During the first 10 years of the photography program founded by Ansel Adams at the California School of Fine Arts, now called the San Francisco Art Institute, Minor White was lead instructor. He invited Imogen Cunningham, Dorothea Lange, Edward Weston, Lisette Model and other definers of 20th Century photography to be guest instructors. 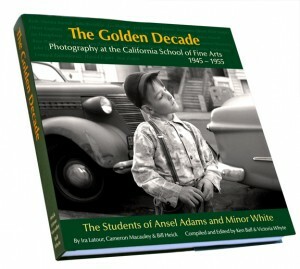 The Golden Decade Book author Ira Latour was in the first full-time class of the photography department, while Bill Heick was in the second class with Victoria Whyte Ball’s father Don Whyte, Philip Hyde and 12 other students. Cameron Macauley was in a later class. 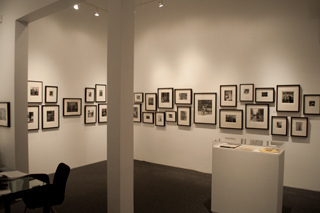 The authors and a large number of other contributors including David Leland Hyde share stories and biographical sketches from the early days of West Coast Photography when the earliest students of straight photography started journeys in the medium, many of which went on to notable publishing and exhibiting achievements of their own. Update: You can now pre-order the Golden Decade from Amazon with a guaranteed savings of $24.09 off the regular retail of $75. The pre-order guaranteed price is 33 percent off at $50.09. To pre-order click The Golden Decade . Have you ever met any of the students of Ansel Adams? 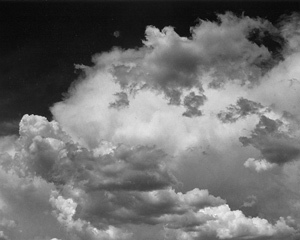 Cumulus Clouds Over Indian Valley, Northern Sierra Nevada, copyright 1948 Philip Hyde. 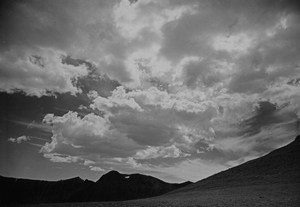 Summer School, as Ansel Adams referred to it, first started in 1946. 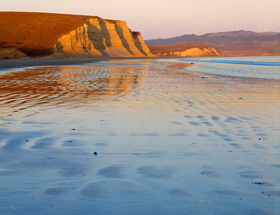 The course ran for six weeks of intensive instruction based on the regular day school in photography at the California School of Fine Arts now the San Francisco Art Institute. Minor White first taught with Ansel Adams in the Summer of 1946 with students including Philip Hyde, Benjamen Chinn, William Heick, Ira Latour, Pirkle Jones, Ruth-Marion Baruch, Don Whyte, Pat Harris, David Johnson, John Rogers, Al Richter, Bob Hollingsworth, Walter Stoy, Helen Howell and others. It should be made very intensive and should reveal within its six weeks span the abilities – or lack of them – of the students. Only those should be admitted who have definite intention to take at least the first year of the main school sessions. The exact topics to be considered in the summer school will be basic but of course should not be too extensive. The first summer school period in 1946 will enable us to clear up various ‘bugs’ in the studio, lab, and general operation. The summer school of 1947 should be designed, I believe, as a buffer course to enable the regular day students to perfect their work and to round out missing or weak aspects of their knowledge. 1: Organization, outline of study and general assignments, etc. 4: Survey of contemporary directions in photography, Critical basis. 6: General discussion, exhibit work and criticism. Four periods devoted to work in addition to the six periods outlined above are required. The exact assignments will be worked out well in advance. An emphasis on regional subject material to be maintained throughout. Full demonstration of all work required. Laboratory assistants will be on constant duty five or six periods out of the total of 10 periods per week. Windswept Pass And Clouds, Yosemite High Country, Yosemite National Park, Sierra Nevada, California, copyright 1949 by Philip Hyde. 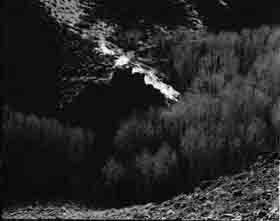 “In the early classes with Ansel Adams, we were with him all the time, day and night,” said Ira Latour, photographer and a co-author of “The Golden Decade: Photography at the California School of Fine Arts 1945-1955.” Ira Latour enrolled at the California School of Fine Arts, now the San Francisco Art Institute, in the first classes Ansel Adams offered in 1945. Ira Latour also took the first full-time class that started in the Fall of 1946. “We were in class with Ansel and in the field with him,” Said Ira Latour. “In the evenings we either printed in the darkroom or got together at Ansel’s house in San Francisco.” The Summer Session 1946, besides being an intensive round-the-clock photography experience, was also an opportunity for students to either show they were ready for the full-time professional training classes or were to continue in the evening classes for amateurs that served as a basis for a semi-professional training. In his book “The Moment of Seeing: Minor White at the California School of Fine Arts ,” Jeff Gunderson wrote that the majority of these students had learned photography in the armed services. 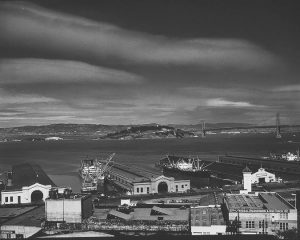 He added that the Fall 1947 Class included an African American student, David S. Johnson, later famous for his Jazz era photographs of San Francisco’s Fillmore District, two Chinese American students, Charles Wong and Benjamen Chinn, who both became noted photographers. The class also included celebrated documentary and portrait photographer Pirkle Jones, who worked with Dorothea Lange, as well as Pirkle Jones’ future wife who also became a well-known photographer Ruth-Marion Baruch. 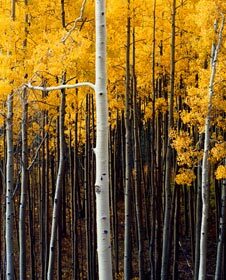 In letters to Ansel Adams, Minor White praised the work of a number of students, in particular the nature photographs of Philip Hyde and the portraits and natural scenes by Bill Heick. 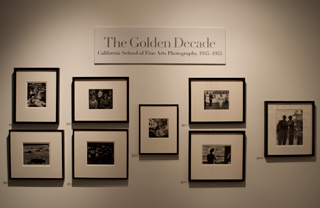 Don Whyte, Ira Latour, Bob Hollingsworth, Helen Howell, Pat Harris, Walter Stoy, John Rogers, and Al Richter all started at the California School of Fine Arts in the Fall 1947 photography class and went on to become prominent photographers in the West Coast tradition. Who Were The Advanced Students And When Did The Students Socialize? The rest of the students sometimes would gather around and B. S. about photography and what they photographed. I had my own darkroom. Usually I attended class then came home and did my own work. So, I never knew, I never had any feedback on my own photography from Minor or Ansel until after I turned my work in. I never did know how I was doing. Philip, your dad, only lately told me, maybe 10 years ago, that the people in class would talk about me and wonder what I would come up with for my assignment. I did everything at home. They never knew what I was going to do. They were always interested. They were surprised when I turned in my assignments or they saw my prints at the print exchange parties. 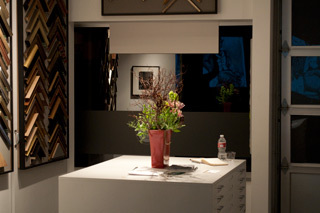 The print exchanges were the only times when Minor and Ansel and some of the other instructors saw my work. Maybe I would just skip and go home. Another classmate, George Wallace, and I became friends when Ansel was giving the zone system. It was very, very complicated. George and I and anther guy by the name of Jerry Seward had engineering training. George Wallace was an engineer for US Steel. The way he got into photography was that his family owned US Pipe and it went down after World War II. George made a deal with his brother to sell him his share of the company. George offered his brother $500/month plus his brother would also pay for tuition for him at photography school. Because of his technical and engineering background George sort of understood what Ansel was talking about. Ansel talked about graphs and exposure care, exposure relationship with density, and a lot of people didn’t know what he was talking about. Somehow George Wallace knew, I don’t know how he knew that I could not understand it. I invited him home to my darkroom and we discussed it among the three of us, including Jerry Seward. We talked about the problem of how to explain it to other students. We also used to get together with other students at homes. The student-teacher Bill Quandt used to get the students to go down to North Beach to a cafe called Vesuvio. It was right across from the Save Right Book Shop. We used to get five cent beers and hang out. Now we have all known each other for 60 years or more. Benjamen Chinn held that the lifetime friendships that developed in photography school started with discussions about photography, efforts to solve homework problems for class and otherwise just enjoying each other’s company down at Vesuvio. At Vesuvio they sometimes drank beer or other alcoholic beverages, but just as often they had sodas or something to eat. North Beach in the late 1940s and early 1950s already had become an interesting part of town with artists, musicians and the beginnings of what would become the epicenter of the beat generation on the West Coast. By the mid to late 1950s, just down off Russian Hill where the California School of Fine Arts would soon become the San Francisco Art Institute, many beat generation writers such as William S. Burroughs, Jack Kerouac and Allen Ginsberg made their homes in North Beach. Today the North Beach neighborhood “overflows with independent literature cafes, old-world delicatessens, jazz clubs and gelato parlors,” reads the San Francisco Art Institute website. Besides the cultural experience of North Beach that developed after World War II and is still thriving today, “Close enough to hear the sea lions barking at Pier 39” is Fisherman’s Wharf, San Francisco’s most visited neighborhood.